In collaboration with the International Polar Foundation, STIB / MIVB (Société des transports intercommunaux de Bruxelles / Maatschappij voor Intercommunaal Vervoer van Brussel) inaugurated a new Metro station in Brussels on Monday, March 23rd. This new underground station, baptised "Belgica", is a tribute to Belgian exploration in Antarctica and a reminder of the dangers of climate change. Belgica is the name of the ship aboard which Adrien de Gerlache led the first overwintering expedition in Antarctica in 1897-1898. 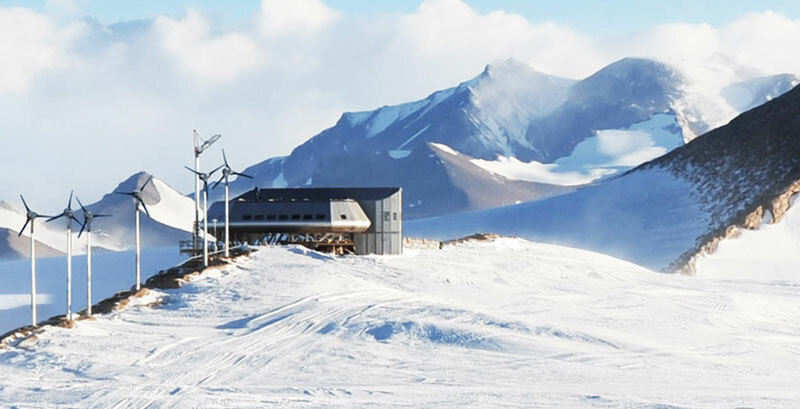 The history of Belgium has since been tightly bound to the Antarctic continent and is now once again at the forefront of history with the recent inauguration of the first "zero emission" research station, the Princess Elisabeth. In order to retrace Belgium's long history in Antarctica and celebrate the International Polar Year, two gigantic murals have been printed on either side of the platform. Texts and pictures were provided by the International Polar Foundation (the polar mural) and the Brussels Institute for Environmental Management (climate change mural). A third mural, the result of a public participation initiative that was undertaken in the Metro station, depicts the views and ideas the wider public has on climate change and the Polar Regions. Various associations, including the International Polar Foundation, had a stand at the Metro station over an entire week with the sole purpose of diffusing knowledge about the climate issue, giving ideas on how to fight the climate challenge and getting people involved in the debate. Directed by the Belgian artist Blaise Patrix (Ateliers Partage SMART, asbl), the result is a magnificent multi-coloured and stylistic mural.